Give them credit, they were the aggressive defensive team tonight, and we gotta get better. We had good shots. We just didn’t, you know, we didn’t shoot well from two…We missed all of our twos and made a bunch of threes. Yeah, it’s just simple as that. I think a little bit, but you know, I don’t think that’s [what] I thought about when I was playing. You know, I just think shots didn’t fall for none of us. Steve Brown: (winks at Benji) So, I hear that Ronda here is so loud you have to relegate her to the basement. Is that true? Brown: (tries again) You know, we’ve had a camera on you two all night and you two are so frisky. You just can’t sit still! Brown: (turns to Ronda) So, you have two daughters but you all are more like triplets! Ronda: Uh, we’d like to watch our son play if you don’t mind. Brown: Back to you, Boler. 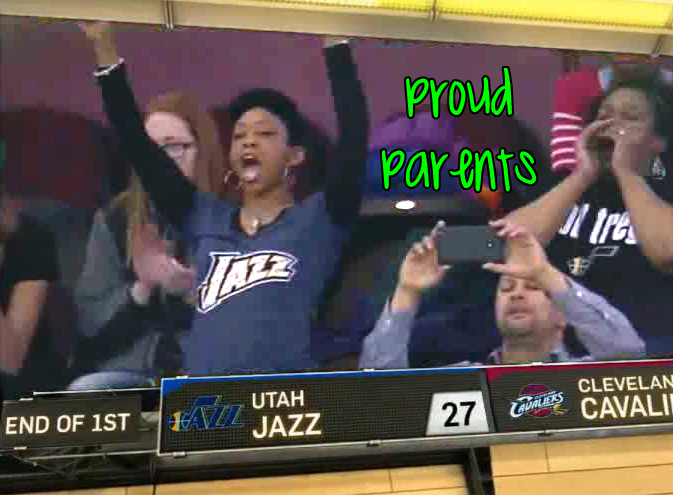 Broadcast shows girl in Jazz jersey sitting in the crowd at Quicken Loans Arena (which, to clarify, is located in Cleveland, Ohio, USA). Harpring: Boler, Jazz Nation, buddy. Worldwide! ** Craig Bolerjack on Gordon Hayward against the Thunder: It was a big one, back on Jan. 7. ** Matt Harpring on Kyrie Irving: He’s got potential to be a hot hand. ** Harpring: You know what? Next time you steal my promo, Boler, we’re gonna go at it. Boler: Oh, I’ll steal yours. ** Harpring: Deng smiling. He just couldn’t get the ball into his hands quick enough. ** Harpring: What’s my fine? Boler: Dinner. And I’m hungry. Harpring: I already got you dinner last night. Boler: Yes, you did. ** Harpring: I can’t tell you what the size for Hawes does for this team. ** Harpring on “Where you watchin’? #JazzTV”: It’s hard. I’ve tried for five straight games and I haven’t gotten on. ** Boler to Harpring on #JazzTV: Do a photo right now. We’ll send it in, see if we can’t get ourselves back on TV. Harpring: I’m not doing you, Boler. Boler: Oh, a selfie? That’s what you’re gonna do? ** Richard Jefferson on the fan running onto the court: I’ve been involved in some weird things. 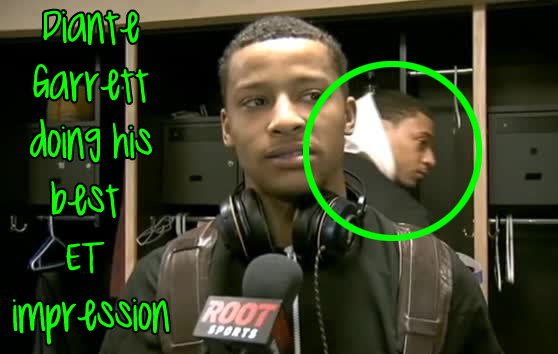 ** RJ on being distracted by the fan running onto the court: I saw the referee make a beeline one time, like, probably two plays later, and I turned my head, ’cause I, you know, you just see random things, and he was going to go pick up something from one of the dancers, and then Alonzo Gee got behind me. And I told the ref, I’m like, “Man, you distract me.” Like, I didn’t know what was going on at that point. 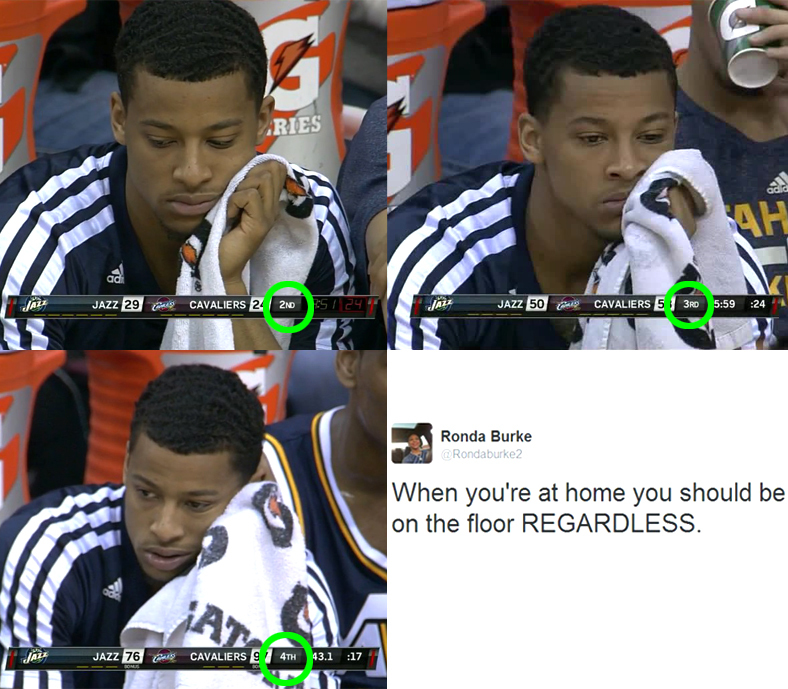 I am guessing the Burke family likes Ty Corbin as much as the majority of SLC Dunk Jazz fans like Ty Corbin.